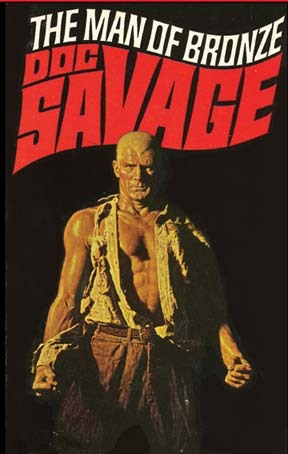 Reading Millenium Comics short-lived Doc Savage series has me thinking about all the stuff we don’t know about Doc. Millenium tried to break the mold (overall successfully—I’ll be blogging about it in the next week or two) by shaking up the formula, delving not only deeper into Doc but further back. One story deals with a blood-feud that began with Doc’s grandfather; Devil’s Thoughts takes place right before the events of Man of Bronze. And that got me thinking about everything that must have happened earlier. We know next to nothing about Doc as a young man. What we learn in the first book (cover by James Bama, all rights with current holder) is that he met his five friends in the Great War (WW I to the rest of us) and they realized after it ended that they wanted more excitement, more adventure. Despite the horrors of the war, it was, indeed, a high point for many people and the idea of the veteran who couldn’t give up on a life of action was a popular fictional conceit—Bulldog Drummond and Agatha Christie’s Tommy and Tuppence had the bug for instance. So Doc invited them to join in the great crusade he’d been trained for, “fighting other people’s wars,” as Lester Dent often put it. From that point to Man of Bronze, we got bupkiss. Doc presumably continued training, getting his MD and mastering all the various skills he hadn’t yet perfected. The guys presumably went back to the careers. But if they were that keen on excitement, would they wait? Did they have adventures, either separately or together? It’s clear they stayed in touch with Doc, so the temptation to dispense some justice must have been irresistible, even though it’s also clear Doc hasn’t formally started his fight for justice yet. In short, the 1920s are a decade in which Doc and the five could have had all kinds of adventures. Or fun—I could see Monk dragging Doc to a speakeasy and getting into trouble. Or maybe Doc went on his own initiative. We know by the end of the 1930s he was chafing at the regimen he lived by—maybe some youthful rebellion wasn’t out of line. It’s a great field to plow for whoever has the rights now. So far the only thing I can think of that tackles this era is Philip Jose Farmer’s Escape From Loki, in which Doc and his friends break out of a German POW camp together. I have my doubts about how well this would come off (having seen Farmer’s god-awful Holmes/Tarzan crossover, The Adventure of the Peerless Peer) so I’ve never read it but it seems close to being accepted as canon. Millenium does, and DC used the prison-camp concept during Mike Barr’s run without following the details. Somebody out there, get cracking on this!